In the tradition of the original Grateful Dead Ticketing Service, tickets will be available via a mail order system starting on January 20th and will be available online to the general public on February 28th via Ticketmaster. 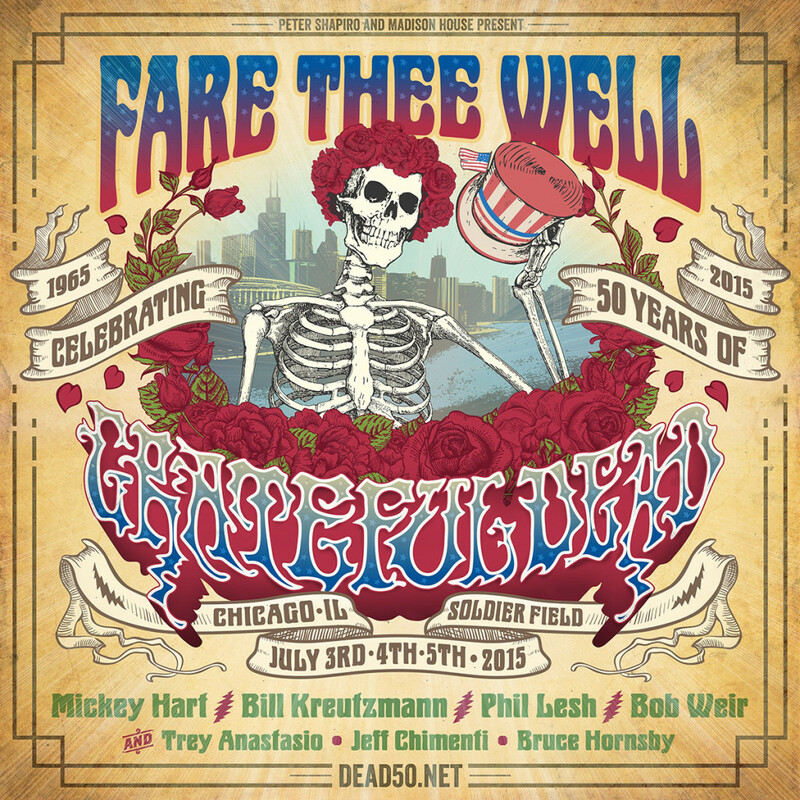 Thank you to all of the Deadheads for the amazing support that you have shown for the Fare Thee Well shows in Chicago! This morning you broke Ticketmaster’s on-sale record when nearly half a million of you queued up to buy tickets online. If you do not have tickets, please know that we are working on various ways to help everyone experience these shows in a way that will help you share this special moment with us. Stay tuned, and thank you for showing your love, we feel it! We’ve been submerged in a sea of mail and are coming up for a breath of air to give you an update on where we stand right now. We are 75% of the way processing all of the orders, working 24/7 to get your money orders back to you. There were many, many times more order requests than anyone imagined, thousands and thousands with beautiful art. We are trying to let as many folks know their status if possible before the onsale date. Emails will go out to the winners starting in the next two days. You still have a small chance if you do not receive an email from us by the on-sale date, however, you may want to consider on line ticket sales to increase your chances. Tickets will be mailed out in June. Please do not email us at this time as we will not be able to answer your inquiry. Okay, we are taking a deep breath and going back under. Wow! We re excited (and humbled) to discover that your enthusiasm for Fare Thee Well matches our own! We have received an overwhelming number of mail order ticket requests. In an effort to honor the history and spirit of the Grateful Dead, we are going to try to fill as many of these orders as possible. This means there will be no other pre-sales. In order to give the good folks at GDTS TOO time to sort through the 60,000+ (!) envelopes received so far the new public on sale is Feb 28th @ 10 a.m. CST via Ticketmaster. Public on sale is Feb 28th @ 10 a.m. CST via Ticketmaster. We are excited to team up with CID Entertainment to offer Ticket and Travel Packages to enhance your experience in Chicago! CID Experiences include amazing seats and amenities. Travel Packages offer a wide range of hotel choices in the Chicago area with your choice of ticket package and round-trip transportation to Soldier Field. Tickets range in price from $59.50-$199.50. There will be a general admission pit directly in front of the stage (pit tickets are mail order only), a second general admission floor section behind the pit and reserved seating throughout the stadium. ADA seating will be offer through Ticketmaster starting on 2/28. All mail order purchasers will receive commemorative Fare Thee Well tickets, designed with art selected by Grateful Dead Ticketing from the mail order envelopes submitted by fans. ***No tickets have been released yet. If you attempt to purchase tickets from an online ticket reseller prior to February 28th they are likely to be counterfeit. #Dead50 will be held at historic Soldier Field – home to Grateful Dead’s last concert in 1995. July 3rd, 4th and 5th 2015. Each night, doors open at 5:00PM and shows start at 7:00PM. Mail order starts 1/20 — click here for complete instructions. The Public On Sale Date is Feb 28th at 10 a.m. CST via Ticketmaster. Yes. 3 day packages are being offered via Dead fan club pre sale, and public on sale. 3 day Ticket and Travel Packages are also available through our partners at CID (see next question). There will be a general admission pit directly in front of the stage (pit tickets are mail order only), a second general admission floor section behind the pit and reserved seating throughout the stadium. The Wharf Rats will have a table near the Participation Row area, in the South Courtyard inside the South Gates, near Gate 0. Yes. The Soldier Field Box office located at Gate 10 will be open to the public on 2/28 at 10am. Where is the Taper’s section? The Taper’s section is located on the floor behind the soundboard. You need a designated taper’s ticket to be admitted to this section. **Note there are some counterfeit taper tickets out there — the real ones are # #19,561 through #19,590 for the three Chicago shows. When/Where Will Will Call Be Open? Show dates- 10am – Last song. The Soldier Field parking lots open at 3:00PM No overnight parking permitted. Who designed the event artwork and directed the Trixie Garcia video?